The 2nd Bureau regular series of stamps were in use from late 1902 to the 1910s and were used on postcards, covers, and parcels to all corners of the globe. Click on a marker on the map below to view mail sent to various international destinations. The U.S. Second Bureau stamps were in use from 1902 to 1910s. Click on the red markers in the map to see a cover or postcard sent to this location. Use the buttons at the top to focus on a region or continent. 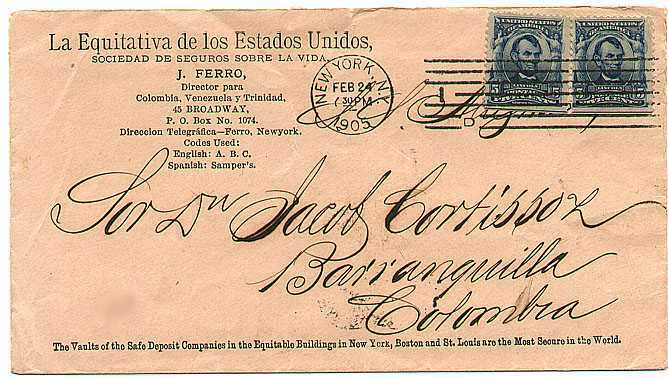 A little about mail rates… The Universal Postal Union (UPU) was created in 1874 and helped standardize mail rates between countries. During the 2nd Bureau stamp era, countries that joined the UPU set their foreign letter rate to 10 centimes per 15 grams or 5 cents per ½ ounce. This rate remained in effect until Oct. 1, 1907, where the letter rate changed to 5 cents per ounce and 3 cents for each additional ounce.